Jeremy Corbyn has condemned comments about the Jewish community allegedly made by a former Scottish Labour MP. 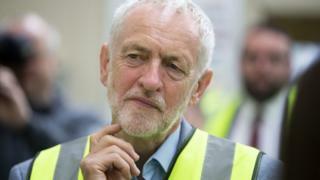 The Labour leader was responding to renewed questions about anti-Semitism in the party as he began a four-day tour of Scotland. In remarks reportedly posted on his Facebook page, Jim Sheridan said he had lost “respect and empathy” for the Jewish community. Mr Corbyn said the comments were “completely unacceptable”. Mr Sheridan, who is now a councillor in Renfrewshire, has been suspended from the party. Mr Corbyn described the comments attributed to Mr Sheridan, which have since been removed, as “completely wrong”. The Labour leader said: “He did withdraw it later on, he has been suspended from membership, there will be an independent investigation – independent of me that is – so I can’t comment any further. Mr Corbyn said he was determined to “eradicate it completely” from the party. Mr Sheridan is the second Scottish councillor to be suspended from the party over online comments made about the anti-Semitism row. Earlier this year, Fife councillor Mary Lockhart suggested that headlines critical of Labour’s position could be the work of the Israeli security services. The row centres on Labour’s new code of conduct on anti-Semitism, which its critics say is not as comprehensive as the International Holocaust Remembrance Alliance’s guidelines. Mr Corbyn told BBC Scotland that he wanted to safeguard “open and proper debate”. “We have adopted the IHRA statement and definition, we’ve adopted many of the examples,” he said. “I are very concerned, however, to make sure there can be open and proper debate about Israel and its foreign policy, and about the future for Palestinian people. Scottish Labour leader Richard Leonard has said he wants Labour to have a “robust” code of conduct that commands the support of the Jewish community. Ephraim Borowski, of the Scottish Council of Jewish Communities, told BBC Radio Scotland he had held constructive discussions with Mr Leonard. Interviewed on Good Morning Scotland, he rubbished suggestions that the row was part of a plot to oust Mr Corbyn from the head of the Labour party. “There will be all kinds of people who have all kinds of different reasons for the attitude that they take to Jeremy Corbyn, or for that matter Theresa May or Boris Johnston, it doesn’t make them plotters,” he said. It came as Scotland’s justice secretary Humza Yousaf revealed he had not yet been interviewed as part of a Labour investigation into Islamophobic remarks made against him. Dumfries and Galloway Labour councillor Jim Dempster was suspended from the party after he admitted the outburst, and apologised for it. In a series of tweets, Mr Yousaf said he had been told the probe would conclude in July but he had “heard nothing”. Hey @LabourRichard at Pakistan Welfare Trust dinner tonight you said you have a zero tolerance approach to Islamaphobia. It has been 5months since a ScotLab Cllr admitted making Islamaphobic remarks against me. I was told investigation will conclude in July. I’ve heard nothing. I’ve never been interviewed by ScottishLab HQ either have the other witnesses I have spoken to. Step up @LabourRichard and show me you are serious about tackling Islamaphobia by your deeds not empty, hollow words. Mr Corbyn was joined by Richard Leonard on the first morning of his trip to Scotland, where he met workers from the Alexander Dennis bus manufacturing plant in Falkirk. It was part of Labour’s “Build it in Britain” campaign to promote British industry. He launched that campaign at a speech in Birmingham last month, in which he promised that Labour would use state aid powers “to the full” to support Britain’s manufacturing sector following Brexit. “What we have had now is eight years of austerity, what we have had is 10 years of frozen wages, what we have is a decline in our economy as a result of that,” he told BBC Scotland.